It’s a nice coincidence that we’re looking at “The Ice Warriors” this time out, considering the news that nine lost Doctor Who episodes from the same era have been found—in fact, they’re all from the two stories directly following this one, “The Enemy Of The World” and “The Web Of Fear.” (And yes, I hope to review both soon.) The second and third episodes of “The Ice Warriors” are among the 97 still missing—the other four parts were recovered in 1988—but they’ve been recreated with animation on the recently released DVD. This narrowing of focus restricted what Doctor Who could actually be about, but it was also an acknowledgement of what much of the viewership was actually tuning in to see: monsters. 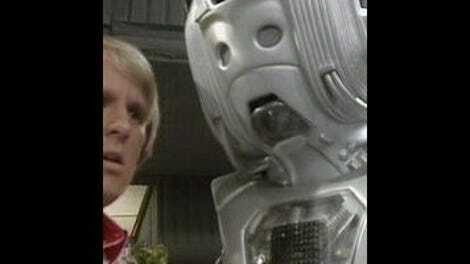 The Ice Warriors were a perfect example of this new direction, being just one of several attempts during the fourth and fifth seasons to find a new recurring villain who could equal the Daleks for sheer menace—that criteria being considered more important than whether they could be a source of interesting or unexpected ways of telling Doctor Who stories. (The Daleks themselves were AWOL after season four’s “Evil Of The Daleks,” when their creator Terry Nation withdrew them from Doctor Who to try to interest American TV in a series about them.) The monster-centric plots also tended to follow the same broad template of the villain of the week threatening an isolated post of sympathetic humans—the “base under siege” plot, which describes more than half of Troughton’s storylines. “The Ice Warriors” is no exception, but it does at least tweak the formula: The hulking, hissing Martians themselves aren’t even really the main threat, but a dangerous complication to what’s already an apocalyptic scene. It’s sometime around the year 3000 (probably, anyway; the story’s not entirely clear on this point). Overpopulation has killed off most plant life, wrecked the environment and caused a new Ice Age, which has already obliterated much of human civilization under the implacable grind of massive glaciers. Our story begins in what’s left of Britain, as a team led by the harried, overly rigid Clent man one of several bases around the world trying to push back the glaciers with a high-tech device called an ionizer which can melt the ice and turn back the climate disaster. The TARDIS crew this time is the same as in “Tomb Of The Cybermen”: the mercurial, impish Second Doctor; the brave if slightly dim Scotsman Jamie McCrimmon; and Victoria Waterfield, a rather sheltered Victorian-era young woman whose response to meeting aliens is largely to scream and be panic-stricken. (A shame, considering she meets so many of them.) The TARDIS lands outside Britannicus Base just as two scruffy-looking thieves, dressed in furs like cavemen, sneak out of it having stolen some food. One of these men is Penley, who we soon learn was formerly the base’s most brilliant scientist, but who quit after a disagreement with the computer-minded, uncreative Clent. We’ll come back to him. Inside the base, there’s panic and confusion as they struggle to keep the ionizer working—Penley, who built it, is persona non grata. Clent, to his displeasure, also has to put up with Arden, another scientist more interested in archeology than fighting glaciers, who finds a helmeted being buried in the ice, carves it out, thaws it and brings it back to life. (A blatant steal from “The Thing From Another World,” but effective.) Though Arden’s crew thinks it might be a Viking, the corpsicle is of a far stranger provenance: Mars. This is Varga, leader of a platoon of Ice Warriors, played with literally hissable, intimidating menace by Bernard Bresslaw. And once he’s awake, Varga wastes no time in kidnapping Victoria, waking up the rest of the Ice Warriors, and preparing a violent response to what he assumes will be an attack by the humans. Ice Age Britain is a fascinating but under-explored setting. The base, for instance, isn’t a futuristic building but an old Georgian mansion retrofitted with a link to an all-knowing computer (well, almost all-knowing, which proves to be the story’s crux). But why this link to the past? It’s there, but nothing’s really done with it. Similarly, Penley and Storr’s hideout is in the ruins of a plant museum where they live off of rare, preserved species of now-extinct food sources like tomatoes and strawberries. You’d think that this place would be just as important to protect as the base itself, considering how valuable its abandoned collections must be to a world threatened by an Ice Age caused because they killed off all the plants. But instead it’s crushed by the glacier in the fourth episode without anyone remarking much about it other than that it wouldn’t be a good idea to remain inside. So the worldbuilding seems a bit sketchy here; Hayles does a better job with his next Ice Warrior story, “The Seeds Of Death.” But what we are told paints a grim picture. The effect that the Ice Age has had on the world is catastrophic, with whole nations wiped out by glaciation and millions of refugees shipped off to Africa and what sounds suspiciously like concentration camps. Clent’s retrofitted mansion-base seems to be the only remaining evidence of British culture left in what was once the United Kingdom—now an isolated outpost in a barren wasteland that’s been literally left to the wolves, largely abandoned by everyone but scavengers like the fur-clad Storr, whose lifestyle suggests that many of those who survive have become little better than Neanderthals. Like “Seeds Of Death,” “The Ice Warriors” doesn’t go into any particular detail about what Ice Warrior culture is like, or what motivates them beyond self-interested bullying and the paranoid caution of Varga, who behaves as if it’s perfectly rational to assume treacherous behavior on the part of any strangers he might meet. That might seem strange if you know them only from their reappearance in the Eleventh Doctor episode “Cold War,” because these days, the Ice Warriors (along with the Silurians) are known as Doctor Who’s noble villains—like Star Trek’s Klingons, they’re dangerous and belligerent but still have a sense of honor and potential common ground with their human foes. 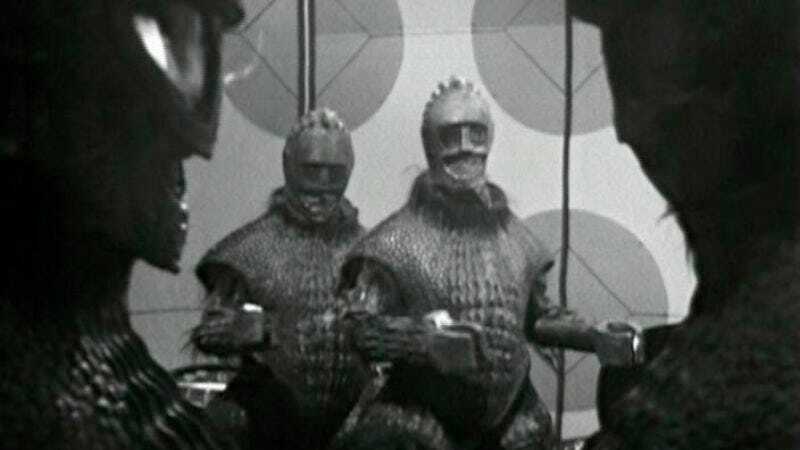 But that reputation was earned later, in the Third Doctor’s “The Curse Of Peladon.” In this early appearance, Ice Warriors are unadulteratedly villainous. (Which is, I suppose, also like Klingons.) Writer Brian Hayles depicts them as intelligent and cunning, but still implacably hostile and determined to treat their situation as a military problem first and foremost. If that leaves them a little one-dimensional, they still make terrifically effective monsters thanks to the memorably crocodilian design of their armor shells, and especially to Bresslaw’s creepy performance as Varga. Director Derek Martinus’ cinematography also effectively emphasizes their massive size—all the actors in the Martian armor were 6’7” or taller, towering over the tinier Doctor and Victoria—leaving an impression of slow-moving but frighteningly imposing giants. Victoria’s habitual terror and screaming panic gets old pretty quickly, but it’s not that hard to sympathize with her being afraid of these guys. And her terror helps sell the most effective sequence in the story, the slow chase scene through the ice caves as she frantically tries to get away from a lumbering Ice Warrior who always seems to loom in the background no matter where she runs, like Michael Myers in Halloween. Although the Ice Warrriors do attack the base toward the end of the story, it’s not so much a siege as a standoff since they spend most of their time hunkered down safely in their own ship. But there is a siege of the base going on—by the glacier. The Ice Warriors are a deadly threat in their own right, but compared to the encroaching Ice Age, they’re literally just in the way. The story’s chief crisis is not whether humans can defend themselves against the Martians, but whether they can take the chance of attacking the glacier: Because their nuclear-powered spaceship is embedded in the ice, Clent is afraid to use the ionizer against the glacier for fear of blowing up their ship and everything else along with it. The real conflict of the story isn’t the Ice Warrior threat, but between Penley’s desire for freedom and Clent and his assistant Garrett’s insistence on rigid adherence to computer control. This break is the proximate cause of their current crisis, because Penley has walked away just when they need him to fix the ionizer that holds back the glacier. The problem with the disgreement, though, is that it’s too simplistic to seem like something real people would argue about. It boils down to “don’t blindly trust computers” on one side, and “yes, blindly trust computers” on the other. How to choose between the two? I’m not sure that this moral quandary is quite complex enough to justify six episodes of screen time. Clent and Garrett can’t make a decision without the computer, which Garrett in particular speaks of in tones that are disconcertingly religious: “Our trust is in the great computer. With its aid, we cannot fail.” But the computer is programmed not to make a move if that action may result in its own destruction. And it’s faced with two alternatives that seem, on the face of it, equally bad: Death by glacier, or death by nuclear explosion. It’s like Woody Allen once said: “Mankind faces a crossroads. One path leads to despair and utter hopelessness. The other, to total extinction. Let us pray we have the wisdom to choose correctly.” But it can’t choose, so it’s paralyzed with indecision, and so is Clent because of it. It’s also a little hard to sympathize with Penley’s initial refusal to help, even if he is right that they’re too reliant on the computer. If Penley stays, he has to work with some people he doesn’t like all that much. If he leaves, a two-mile-thick slab of ice will grind away everything that’s left of human civilization on the British Isles. Dude: Quit after you melt the glacier. If you really can’t stand it, file a complaint with human resources. The solution is obvious to both the Doctor and Penley, who are cut from similar cloth: If the odds say you’re going to die either way, take the risk that at least has some small chance of success, and that way you might not die. So they do, and thus ends the story, wrapped up a little too neatly for comfort. • The Second Doctor’s ongoing disdain for computers shows up again here. Though he hates them, he’s still so well attuned to technology that he correctly deduces Clent’s computer is about to explode by hearing a flaw in the sound of its hum from the hallway outside. • Oct. 26: If not “Enemy Of The World”: A look at a Doctor Who that might have been, with the animated 2003 tale “Scream Of The Shalka,” starring Richard E. Grant as a decidedly different Ninth Doctor than the one we know now.